17th Century farmhouse set in 25 acres of gardens, with superb views over the Douro River, reached by a lovely winding track through the grounds. The property, with its orange, lemon and olive groves, has been in our family for several generations and the many prints, sketches and photographs lining the walls tell their own history of the Port Wine region of Portugal. The property is 70km from the coast and Porto (home of the Port Wine cellars and with its town centre designated as a UNESCO World Heritage Site). The house has been fully modernised whilst still retaining its unique charm and atmosphere. This is the place for the ultimate relaxing escape, where you will enjoy total privacy whilst taking in the most magnificent views. Nearby, there is also a thermal retreat which offers spa treatments. There is plenty to see and do whilst exploring the area, including the delightful, historic towns of Amarante, Braga, Lamego and Regua. A car is essential to get the most from your stay in this idyllic setting, but there is a regular train service between Porto and Pocinho, stopping at Regua and Pinhao along the way, where you can alight and enjoy a river trip, or simply sit at a waterside restaurant and relax. In addition, your host will be delighted to arrange guided sightseeing or wine tasting tours throughout Douro Valley’s Port Wine producing estates and also give information on local amenities, shops and restaurants. There is also a possibility of transfer from/to Porto airport by previous arrangement. I am the property owner and manager, now retired, 72 years old. I live on the farm estate in another property. I am available to welcome guests and here to offer assistance during your stay. Check in is quite flexible. This unique and beautiful property has been in our family for generations. It is the most wonderful place to relax and unwind. This is a spectacular location with stunning views, set in an unspoiled area with amazing food and wines. The house overlooks the River Douro with boats that you can take for a cruise along the river, which the owner can book for you. At the house there is free Wi-Fi access for the guests’ use. It is close to Port Wine country where you can visit the farms producing this famous drink and taste the Douro wines. It is within an easy drive of Porto, for the city sights and the airport. You will also find that prices generally are very reasonable, whether shopping or eating out. The local people are very friendly and are always willing to help visitors. A portuguese mobile telephone is at clients disposal to contact the owner free of charge. 2 units in the corridor and one in the office / 12000 btu. 2 units in the corridor and one in the office. Bed linens, bath and pool towels provided. Starters for the washing and dish machines. All towels in both bathrooms and kitchen, and also pool towels. Lounge with large fireplace, satellite TV, video, free 4G-20 internet access, books from previous visitors, Douro books, general information about the area, specially about Port Wine. A large previous guests library and the owner´s library of Porto wine and Douro Valley. Fabulous garden and grounds with a new large pergola at the front of the house providing a lovely shady place to eat, drink and relax. Canopy at the back of the house provides a shady spot to eat. Amarante golf course, 9 holes, 45km. 10x5m 1.5 - 2.0m Sun loungers, parasols,a large pergola and pool towels provided. The farmhouse is set in large grounds of 25 acres/10 ha and faces south so it benefits from sunshine all day long. The owner lives close by, so your check-in time is very flexible, just ask. Sorry, no pets On request we can provide an extra single bed in one of the rooms. Outside: Large Private Outdoor Swimming Pool for guest use only size 10mx5m. Unheated, depth min 1m depth max 2m. Sun loungers, parasols and pool towels provided. Gas Barbecue Area with garden furniture, tables, chairs, sun umbrellas and pergola. All weather table tennis. Utility Room: Ironing facilities, detergents for washing machine and dishwasher available for guests. Cleaning/Towels/Linen/Maid service: House and pool towels and linen are provided. Full house cleaning, change of linen and towels once a week. Extra cleaning or change of linen/towels on request. Maid service on request. Air conditioning/heating units in corridor and office. Special rates for bookings of 3 months or more, Nov, Dec, Jan, Feb, Mar. Just spent 7 days at Quinta Do Loureiro. Absolutely fantastic holiday. The house has everything that you could need on a self catering basis. It is situated on the side of a hill overlooking the Douro. Waking up to the view down to the river, which is the same for all 4 bedrooms, is the nearest I think I’ll get to a religious experience. The house is also 5 minutes drive from Mosteiro station . This gives easy access to Porto and various towns up the Douro valley. Francisco is a charming, friendly and helpful host. Our aim is the success of your travel. Coming to our Douro Valley we sugest our guests the most important references of our region. Douro wines at first and after our places to visit and enjoy the hospitality of our people. I hope you reach your goals. Come again you are welcome. This was our third stay at Quinta do Loureiro and once again we had the most fantastic holiday. Francisco is the perfect host, so friendly and helpful. The house is situated in an idyllic setting, it is so peaceful and a wonderful place to relax. The views are stunning, the pool is fantastic, especially this time with the new permanent shady pergola for some of the beach loungers. We just enjoyed waking up to the tranquillity of the surroundings, watching the boats going up and down the river as we ate our breakfast, and watching the sun go down from the dining table on the terrace. Everything is provided in terms of linen and kitchen equipment, you could not ask for more. We cannot wait your return. I loved your stay at my home since we met at the meeting point. Thank you for your stay at Douro Valley. Welcome anytime at Quinta do Loureiro. Charming house. Great location and base for a winter's holiday in the Douro Valley. We travelled to Portugal from Australia for a short, 2 week holiday. We had 5 nights in the Douro Valley at Quinto Do Loureiro. Our holiday was over the New Year period. We found the winter weather in Portugal mild rather cold. Gathering from the QDL guest books, most folks staying there did so when the weather was warmer and the days longer. For us, though, QDL provided a fine base for our touring (even venturing to Spain one day) and after a day's driving it offered us the warmth of a bright fire with a good stack of dry wood, where eating the fine food prepared by one of our group and drinking big local reds was the order of our evenings. The highlight of our entire trip to Portugal was lunch at the DOC restaurant of chef Rui Paula sitting alongside the Douro River at nearby Regua. Fabulous. QDL had everything that we needed. Its old age brought a charm and grace but this was coupled with all the mod cons. It was very clean and tidy. QDL fitted in well with our holiday plans that included nights in Lisbon and Porto. I must say that the owner Francisco Neto was very pleasant to deal with - he is a hassle free person. Thank you Paul for your winter stay at Quinta do Loureiro (QDL). places along Douro Valley to have a pleasant meal, tasting our best Douro wines and it is nearby our place. I agree , our place is a good base to visit all Douro Valley. I have enjoyed your visit and invite you to come again you are very welcome at my home. Fabulous views, peace and relaxation - a very special place. We loved many aspects of staying at Quinta Do Loureiro. The house has a charming mixture of antique furniture, paintings, sketches and port wine memorabilia, all of which we found interesting to look at and gave it a lovely atmosphere and sense of history. The kitchen was well equipped, the big fridge freezer was great and made self catering easy. The grounds with their citrus and olive trees were pleasant to wander through and we enjoyed the privacy of not being overlooked by other properties. We loved having so many different areas to sit and admire the views from. The pool and pool area were excellent, we appreciated the shade from the pergola but also the stunning views across the Douro Valley and it was a great place from which to admire the sunsets. We nicknamed the little area under the wisteria with two benches and table 'G&T terrace', and it was a great place for a morning cuppa whilst watching the sunrise or a late afternoon aperitif. Most of all, we just loved watching the view over the valley as it looked so different throughout the day depending on what the light was doing. Early morning mist burning off the water, golden late afternoon sun and twinkling lights at night all gave an endless supply of things to look at and admire which we found deeply relaxing. When we did tear ourselves away we made good use of the trains from Mosteiro (only a short drive away, the man in the ticket office was very helpful), visiting Porto for the day, a day in Tua and Pinhão for lunch, siteseeing and port tasting and then back to Pinhão for lunch and a river boat cruise. The train is well worth using as it follows the river bank and gives great views along the way. We used the hire car to visit Lamego, Amarente (particularly lovely to wander round) and Cinfaes. Francisco was very welcoming, helpful and discrete. We knew we could ask him for help if we needed it but appreciated being left to our own devices for complete privacy, peace and quiet. This is a very special place and one to which we hope to return. Thank you for your review and stay at Quinta do Loureiro. Our home is realy located at a very special place at Douro Valley. From there we can reach all the Douro Valley by train using the train station near the house, Mosteirô that i always recomend. Also to visit Porto , train is nice option as well to visit Pinhão , Tua and Régua for a boat cruise. I see you have followed my sugestion. Next year there is a nice pergola for a nice shadow around the pool as well as units of air conditioned in the house. I loved to know you have been well and relaxed. Thank you again Mike & Heather. Thank you for your stay at my home at Quinta do Loureiro. I´m very happy you all have been well. I really enjoyed your nearness at Quinta do Loureiro. I wish you can come again you are very well welcome. The winter time is a mild season and the house keeps a nice temperature so it is also a nice option. The view...always stunning waiting for you. 1. Transfer from/to Porto airport for a relaxing arrival at the farm, with stops for shopping. 2. Port Wine tours. A one day trip visiting Douro Museum at Régua, two farms producers of Port and Doc wines (table wines certified as Douro wines), lunch at Doc restaurant, minibus tour at Pinhão by Quinta das Carvalhas and return. 3. Booking of taxi services and restaurants. Beaches on the coast at Porto, one hour drive / train. Travel: The nearest international airport is Porto (70km, 1.5 hour drive) – Ryanair flies directly from Stansted, Liverpool, Dublin, Paris, and Frankfurt. Easyjet has direct flights from Bristol. Served daily by BA/TAP from Heathrow and Gatwick; also Air Berlin, Lufthansa. A car is essential during your stay. Hire is available at the airport and from Porto and it is best to book when booking flight. This is a wonderful opportunity to enjoy this unspoilt region of Portugal and discover the environment in which Port Wine has been produced for centuries, from the tranquil atmosphere of our Quinta, where you can pick your own oranges for fresh juice every morning. Relax, unwind and immerse yourself in the peace and quiet that this unique property offers. 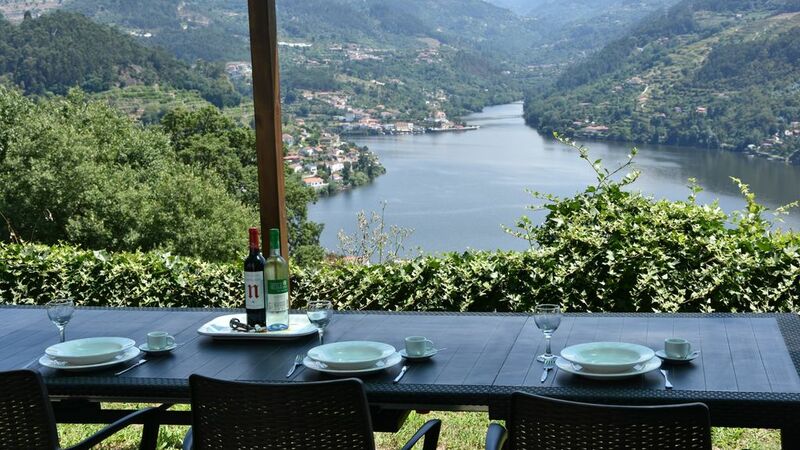 The estate is ideal for artists, families or groups of friends, with its combination of total privacy, superb views and close location to the historic city of Porto, and the Port Wine producing estates. All three are classified as UNESCO world heritage sites. For your comfort we can organise transfer from/to Porto airport and tailor-made tours, for an additional cost, so that you get to know the best of our beloved valley and its many attractions. The boat cruises from Régua to Pinhão and back (with optional lunch on board) are highly recommended to see the Douro Valley and I can book these for you. From Régua I can recommend bus trips to visit wonderful views of the area and local Port wine producers to taste the famous Port wine produced at Douro Valley. The house is served by train, with a main station close the house. I recommend a train trip to Régua or Pinhão or further to admire all of the Douro Valley. Also possible are walking tours, fishing, river cruises, golf, or just relaxing by the pool gazing at the view, enjoying a glass of local wine. All the information is available at the house, or just ask. Booking Notes: 25% to secure the booking, with the 75% balance due at check in date. We now offer special rates for longer bookings of three months or more during the low season, which includes November, December, January, February and March. Additional fees are payable for Christmas and the New Year. Please contact us for more information. Changeover Day: Changeover day is Saturday but can be flexible, ask the owner please. Check-in time very flexible, please ask, the owner lives in the farm. Check-in after 2pm / 14:00 Check -out by 10 am / 10:00 Special prices for long term rentals.